In an effort to increase awareness of OEPA and our mission of protecting the small conventional vertical producers and royalty owners, we have been offering a series of Lunch & Learn’s throughout the state in 2018. These luncheons bring together oil and gas producers, vendors and interest holders for a unique experience where they have the opportunity to network and hear how OEPA is advocating for their rights at the state capitol, the commission and in the courts. 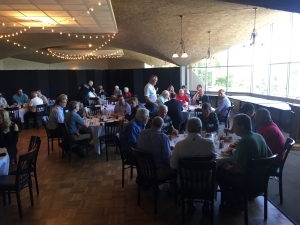 During each luncheon, guests enjoy casual networking time, a seated lunch and a short presentation about OEPA’s mission and progress from board members and legislators. Since the program’s inception in early 2018, OEPA has hosted Lunch & Learn’s in 6 cities: Ardmore, Cleveland, Duncan, Oklahoma City, Seminole, and Tulsa with over 350 in total attendance. These numbers tell us that there are hundreds of producers around the state who are looking for someone to appreciate the problems they are facing. 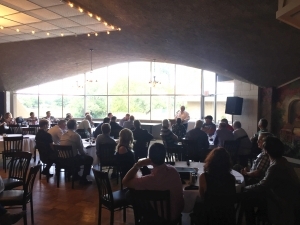 At our luncheon in Ardmore at the end of August, over 75 attendees listened as a panel of lawyers and engineers provided their expertise and advice on always being proactive when dealing with any horizontal drilling activity. Sample letters were provided to send out to horizontal drillers when a vertical well owner receives notice of a horizontal completion to be installed near their well. See the letters here. At our September Duncan lunch, our message was delivered perfectly by the legislators attending, stating that if you want representation at the capitol, you need to join OEPA. We had over 50 attendees, including numerous OCC District Field Staff. We were once again reminded that OEPA is the new voice of vertical producers in Oklahoma. We have upcoming Lunch & Learn’s scheduled in Oklahoma City, Ada and Tulsa. Watch our website and your inbox for more information! We hope you will join us soon!